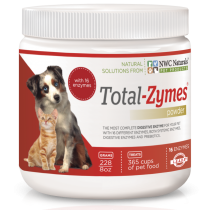 Total-Zymes by NWC Naturals are a high performance broad-spectrum digestive enzyme formula. Total-Zymes ® is the most complete pet digestive enzyme product in the world, now utilizing 16 high performance Vegetarian enzymes and L.E.A.D.S.® Live Enzyme Activated Delivery System®. L.E.A.D.S.® insures complete digestion and assimilation of all your pets food at a cellular level. That's why we at NWC Naturals Pet products formulated Total-Zymes ® with a special blend of SIXTEEN powerful Vegetarian enzymes to completely digest and deliver all the nutrients of today's modern pet diet. With just one scoop of Total-Zymes ® per cup of any pet food we have also added 120,000 FCCPU of bromelain from pineapple as a systemic Enzyme. This will help support pets with Allergies, Itching and the Painful Stiff Joints of older pets. Now with Pre-biotics to help with implantation of the goof guy bacteria in the gut. Using Total-Zymes ® on your pet's food is as close to the benefits of an all raw food diet as you can get.